Check out the list of events happening in Mondrian Doha this February! 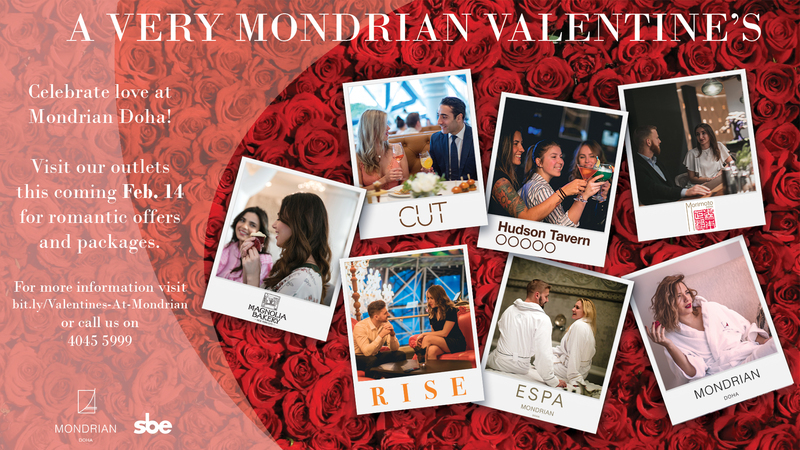 February is a super exciting month for us here at Mondrian Doha, with plenty of events and activities going on. Read on below! QAR 450 per person (includes a glass of bubbly and a rose for ladies). Call +974 4045 5999, email wineanddine-mondriandoha@sbe.com or click here to book your table. Experience a culinary journey of delight with Friday brunch at CUT, every Friday from 12.30-4.00pm. The most delectable food and thirst-quenching drinks are perfectly accompanied by the mellow beats of our Resident DJ. CUT is taking brunch in Doha to a whole new level. QAR 295 per person with soft beverages, QAR 395 with special beverages. To celebrate Qatar Sports Day, Hudson Tavern will be open from 12.30pm on February 13th. A special sports quiz will be hosted to get the night started while Spanish DJ Nuria sets the tone. Grab your sport savvy mates and come down to Hudson Tavern for a chance to win a 1 year Gym Membership, a relaxing massage at ESPA or a complimentary Brunch at CUT. Not in the mood for loved-up couples? Grab your single mates and head down to Hudson Tavern for all things Anti-Valentine’s. Celebrate being single to the sounds of DJ Nuria, while enjoying special drinks and fun games on the night. Toast to your love in Doha’s most stylish new venue, Rise at Mondrian Doha. It’s all about good company and a great atmosphere, with our live DJ and Saxophonist elevating the night at Mondrian’s exclusive rooftop venue. Enjoy the open bar and canapes under the stained-glass roof to romance up your night! Couples QAR 550, Single QAR 350. Diners at CUT and Morimoto will receive 20% off entry. Spoil your loved one this Valentine’s Day with delicious heart shaped goodies from Magnolia Bakery. To show our love for you, we’re offering all of our sweet treats at a 14% discount. Treat that special someone with our Valentine’s package. Enjoy the lovingly decorated ESPA VIP Suite for 2 hours, choose any 60-minute massage and end the experience with sumptuous cupcakes from Magnolia Bakery. Call +974 4045 5550 or click here to make your booking. It’s time to spoil your loved one this Valentine’s month. Enjoy a one night stay in a Standard Room for QAR 969 or a Deluxe Loft Suite for QAR 2,269 and wake up to breakfast in bed for two with a bottle of champagne. Call +974 4045 5777 or click here to book.